It’s that time of year again, the weather’s getting warmer, the days are getting longer, and it’s time to celebrate Dad. June 17th is Father’s Day and we understand how difficult it can be to find him that perfect gift. The espy stylists are the experts when it comes to helping you show Dad how much you appreciate him. Allow them to be your guide to discover something he’ll love no matter what type of Dad he is. He works hard all day but at the end of it you know he’ll come home and barbecue something amazing for the whole family. He needs jeans that are as comfortable as sweatpants but still look great. We recommend a pair of 34 Heritage in Vintage Core wash. 94% Cotton blend, these have an actual ‘denim’ feel to them, something every Dad can appreciate. He can count on these jeans to wear all the time no matter what type adventure he’s on. Pair them with a 100% Pima Cotton Robert Barakett shirt that not only looks amazing but feels like he’s owned it for years. Don’t stop there! 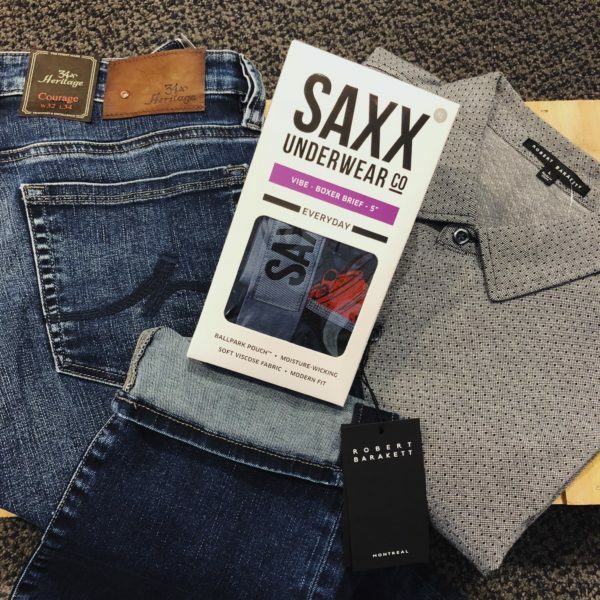 Finish off his outfit with a pair (or 3) of “life-changing” underwear from SAXX. Once he wears these once, he’ll never go back to anything else. This Dad always looks his best no matter what the occasion. He’s always open to something a little more unique and definitely has some fashion savvy. 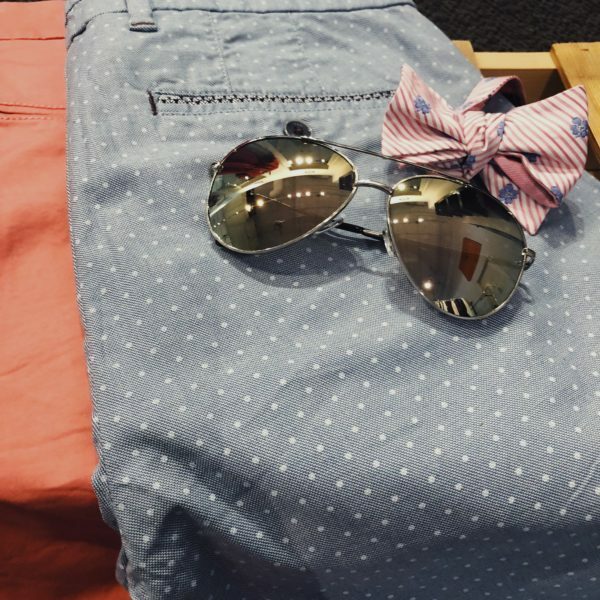 With our variety of shorts from Ted Baker, Matinique, and Mavi in a fun prints and seasonal colors, he’ll be sure to approve. Summer wedding on the horizon? A bowtie from Adesso Accessories is something so simple that can say so much about Dad and his fashion sense. It’s the perfect gift for that Dad who likes to peacock every now and again. Come check out the Adesso in-store pop-up happening June 14 + 15. Because he spends most of his time at the office, he needs something with a little functionality. A nice shirt he can wear to work is a no-brainer, plus he’ll think of you every time he puts it on. R2 Amsterdam, a long time espy favorite, offers shirts with 37″-39” sleeves. So whether he’s on the taller or shorter side, we’ll find him the perfect fit. Pair it with a Lief Horsens blazer and you can be sure he’ll get tons of wear out of this look and feel incredible. 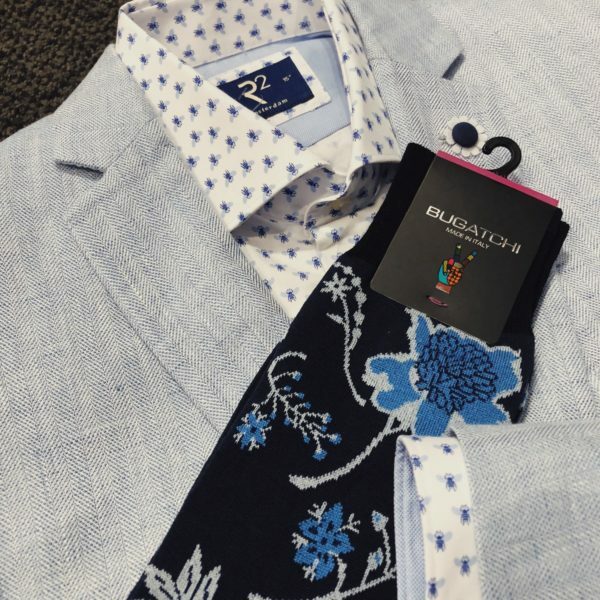 Subtly spice up the outfit with a pair of Bugatchi socks in an exciting pattern. He probably looks younger than he is and no one believes that he’s your Dad. Refresh his style from the ground up in a Parc City Boot. Brand new to espy and made in Portugal. With these on, he’ll continue to give off that cool Dad casual vibe. 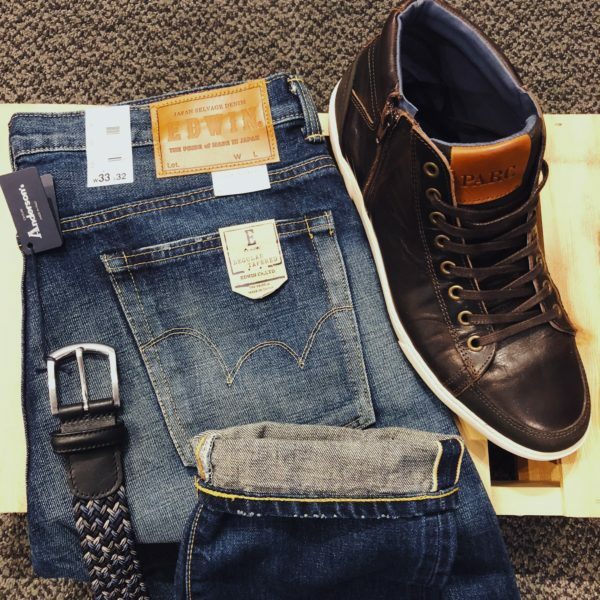 Complete the look with a pair of Edwin jeans, 100% cotton, designed and made in Japan, these jeans are something he can wear on most occasions. To finish off this look get him into a hand-woven Anderson’s Italy multi-stretch belt. Made in Italy and unlike any other, he’s sure to love it for years to come. Something unique and out of the norm to gift him is a Closet Intervention. The espy stylists are happy to share their expertise by going through his closet, putting together outfits, getting rid of things that have over-stayed their welcome, and figuring out what’s missing in his wardrobe. This is truly a gift that keeps on giving, he’ll feel his best every day when he leaves the house thanks to you! But remember, you can always let choose for himself with an espy gift card. Use it towards a special Father-Son or Father-Daughter shopping day and spend some quality time with him. After all, the most precious gift you can give him is time spent together. You can count on the espy stylists to find him pieces he’ll look his best in and absolutely love for years to come. Happy Father’s Day to All the Amazing Dads Out There!